Misa Katagi has grown up in Tokyo, in Hong Kong, in Shanghai; she has studied at Cambridge in England and at Franklin & Marshall College in Lancaster. But it was a summer volunteer program in Cape Town, South Africa, that solidified her long-term goal: to empower women in the workforce, and to emphasize policies that acknowledge women in leadership positions. "Having a stable career and balancing a personal life isn't often seen as something you can do. There are not many (female) role model managers in the workforce" in her native Japan. The senior, who will graduate early after this semester, said she wanted to look at how that issue is perceived in other countries. Her Marshall Project stipend funded a volunteer trip through Global Vision International, which operates more than 250 initiatives worldwide. Katagi's job? Instructing about 100 women – some of whom had never touched a computer before – in programs such as Microsoft Office that would boost their employability. Katagi and her GVI colleagues also organized a library program for local children to give them something to do during winter break. About 50 children showed up every day, from infants to teens, so the lessons were wildly wide-ranging. Some were typical day-camp activities, some, like English lessons, were more involved. Katagi also worked with local elementary-age schoolgirls on topics such as dealing with emotions and puberty, "things even I wish I'd learned when younger," Katagi said. Sometimes, she said, the "unofficial" lessons were just as important as the volunteer program's stated goals. "This was an important conversation to have, the conversation of 'What do you want to do?'" and trying to figure out a path forward. Those conversations were possible because the four-week stay gave some foundation to build a relationship, Katagi said. "I definitely went to Cape Town with an open mindset," Katagi said. "I've learned that having expectations can be disappointing, even if the experience is good." 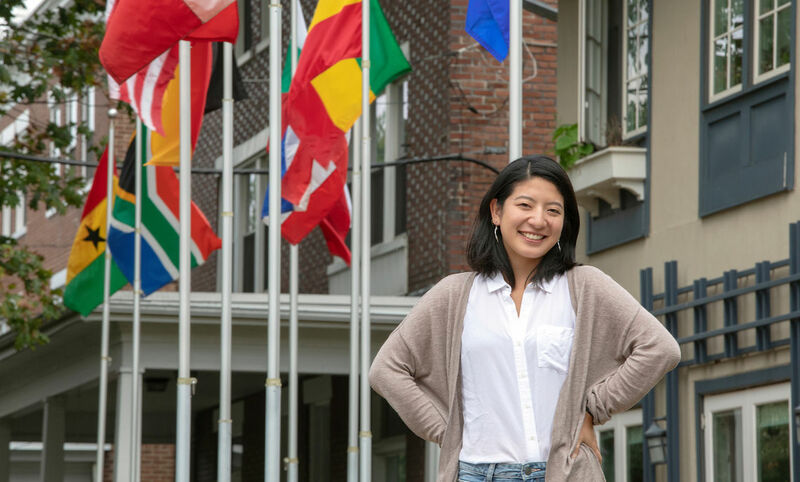 After presenting "Women's empowerment in South Africa" at the autumn research fair, the business major and sociology minor will prepare to graduate and move to Tokyo for her next adventure. Her job with the world's largest consulting firm, Deloitte, begins in April.